A big battery, charged by a DC-DC Charger and Solar Panels. That's our solution to longer stays and more Free Camping. Most Auxiliary Battery Installations utilize a small space usually available under the bonnet. In my case, the space in the Mazda BT50 would only accommodate a 85AH battery, which really is too small to do the job properly. So instead I used the space available in the back, beside the Drawers, to house the 125AH AGM Battery. A battery tray was bolted to the the floor of the tub and the battery secured. I then made a Battery Box to fit the available space, in which I fitted a REDARC 1225 BCDC Charger. I chose this model, as it has a built in MPPT Solar Controller, which is very efficient. Rhino Racks were fitted to the roof of the BT50 and a 120W Solar Panel fitted. 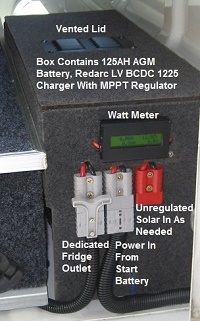 It is wired to the REDARC 1225 via a relay, which automatically switches between the available charging source...the Alternator while driving and the Solar Panel when stationary. A separate Anderson Plug (red) was fitted to accommodate a portable, 120W Solar Panel, for times when the vehicle is parked in the shade. All this is in addition to the two 130W Solar Panels we have on the roof of the van, charging our 120AH House Battery. With this set-up, we can free camp for as long as we like, provided adequate sunshine is available. Plentiful water is, of course, the other limiting factor. See our solution here. Cost wise, this set-up panned out at $245 for the Battery, $389 for the DCDC Charger, $120 for the Solar Panel and $360 for the Rhino Racks. The MDF Board and carpet covering for the Box, Anderson Plugs, Watt Meter and wiring... probably another $100. So all up the Project Cost about $1200.